Despite billions of dollars spent since the 2003 U.S.-led invasion toppled dictator Saddam Hussein, many Iraqi cities and towns are still experiencing severe power cuts and rolling blackouts. 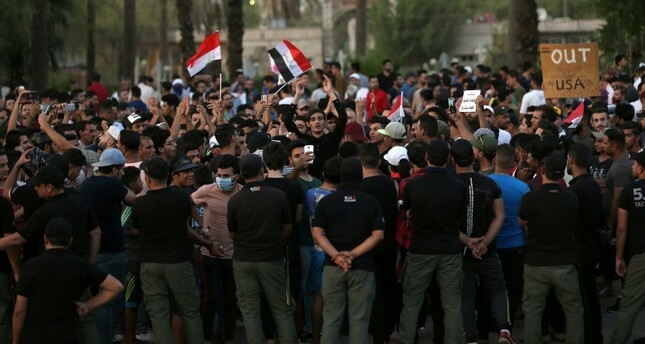 The issue has also partly fueled this month's protests in Iraq's southern Shiite heartland, mainly in the energy-rich province of Basra, where demonstrators have demanded more jobs and better services. The protests turned violent earlier this month when security forces opened fire on the angry mobs attacking and burning government offices and the offices of political parties. Several protesters were killed and wounded, while others were arrested. The suspension came a day after the country's elections commission, run by judges appointed after widespread allegations of fraud and irregularities in the May 12 general elections, endorsed al-Abadi's recommendations to sack five election officials. In a statement issued on Saturday, the spokesman for the Independent High Elections Commission, Judge Laith Jabr Hamza, said the five were sacked over charges of "irregularities, manipulation and financial corruption." They are the directors of the commission's offices in the provinces of Salahuddin, Anbar and Kirkuk, as well as offices for the Iraqi diaspora in neighboring Jordan and Turkey. Judge Hamza did not elaborate. The commission is in the process of conducting a partial recount of the ballots, both from inside and outside Iraq. The process has delayed the ratification of the final election results, and has prolonged the process of forming the new government. The initial election results gave a bloc organized by populist Shiite cleric Muqtada al-Sadr the largest share, with 54 seats in the 329-seat parliament. It was followed by an Iran-backed bloc — made up of Shiite militias — which won 47 seats, and al-Abadi's alliance, with 42 seats.